Mozilla Firefox 6 Final Free Download. | Kanishk's Technical Blog. Mozilla Firefox 6 Final Free Download. 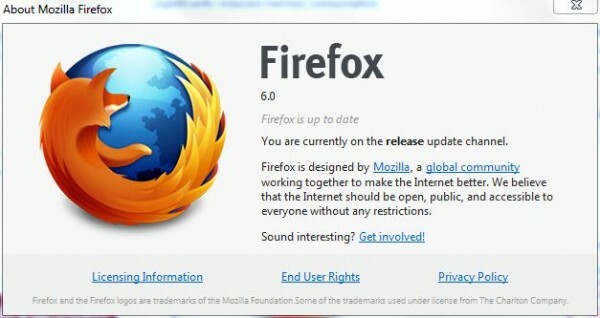 The final version of Firefox 6 (FF6) is already available for free download ahead of the scheduled release date on August 16, 2011. The setup installers of Firefox 6 has already been posted on Mozilla FTP server, which is accessible to all. Firefox 6 does not have major cosmetic change though, but is nonetheless a major upgrade as it improves on Firefox performance and memory consumption, which now is snappier and uses less memory. In addition, the domain name of the URL is now been highlighted and made bold. Mobile version of Firefox 6 for Android will be released together with the desktop version. FF6 for Android offers fresh visual style, enhanced browsing experience, smooth scaling and scrolling. After Firefox 6 is officially released, Firefox 7 will be moved to Beta Channel, likewise for Firefox 8 that moved from Nightly Builds to Aurora channel. Early adopters can also download Firefox 9 in the Nightly Builds channel.